On a rainy afternoon in a suite at the Manila Doctors’ Hospital in Ermita, theater director Frank Rivera is enjoying another breather from his regular chemotherapy sessions, which have been going on since April this year. Rivera is afflicted with lymphoma, a type of blood cancer which, in his case, developed on his bone marrow along his dental structure. To prevent the cancerous cells from spreading, doctors had to take away part of his cleft and his gums in an operation that took some 12 hours. This is his fifth month in the hospital and, thus far, he has paid only P700,000 and still has a balance of P1.2 million. To help him raise the amount, a fund-raising concert will be mounted on Oct. 18 at the Emilio Aguinaldo College along Taft Avenue, with a 3 p.m. matinee and a 7 p.m. gala. Rivera’s head is now bald, but hair is starting to grow again. With the cleft and gums on his left cheek taken out, his speech has become slurred. A graduate of the University of the Philippines where he majored in English and Pilipino, Rivera was lured into theater during the last years of Severino Montano’s Arena Theater Guild. Those were the times when, along with Montano, Rolando Tinio, Jonas Sebastian, Tony Mabesa and Anton Juan were the respected theater stalwarts. UP was lorded over by National Artist for Theater Wilfrido Ma. Guerrero. Rivera started out writing poetry (he still does these days) and ventured into playwriting. He soon began winning prizes. 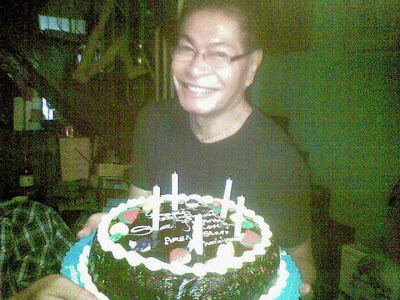 His love for the arts was nurtured in Paete, Laguna, where he was born 65 years ago. “When I was about 3, I used to mount puppet shows using paper cutouts. Since I could not read at that age, I verbalized what I saw as parang komiks,” he recalls. When he visited Mindanao State University in the early 1970s, Rivera felt he could do something original and exciting in that campus. In 1974, he founded the Kambayoka Theater Ensemble, which drew its inspiration and aesthetics from the rich indigenous cultures of Mindanao, particularly the Maranaos of Lanao. Kambayoka adapted the folklore, customs and folkways of the communities around it, including their oral and written literary traditions, visual arts and music. But he persevered and, in time, Sining Kambayoka would establish itself as a theater force in the south. From the Marawi campus in Mindanao to the Rajah Sulayman Theater in Fort Santiago and all over the country, Sining Kambayoka has toured all over the country, and is also a favorite participant in international theater festivals such as in South Korea, the United States and the United Kingdom. The ensemble was the official Philippine representative in the recent 2013 International Ramayana and Majapahit Festivals held in Yogyakarta and Surabaya, Indonesia. Organized by the Indonesia Ministry of Education and Culture, the festival had participants from other Asian countries including India, Cambodia, Myanmar, Singapore, Indonesia, Malaysia, Laos and Thailand. One of Rivera’s books, “Mga Kuwentong Maranao.” Rivera has authored 21 books of plays for stage, radio, TV and film, plus short stories, essays and four books of poetry, published by the UST Publishing House. Kambayoka has also garnered awards and citations from various awards-giving bodies, among them the Aliw Awards and the Gawad CCP para sa Sining Pantanghalan. The ensemble’s repertoire is encapsulated in Rivera’s book, “Mga Kuwentong Maranao,” where he recounts how Sining Kambayoka became one of the most acclaimed and established theater groups in the country. In the same book are political satires that Rivera wrote during Martial Law. The plays blended Maranao artistic traditions such as the “bayok” (chant) and characters from tribal tales with commentaries on the contemporary political situation. Also known as “makata sa cell phone” with his popular “textula” series, Rivera has, to date, authored 21 books of plays for stage, radio, TV and film; plus short stories, essays and four books of poetry published by the UST Publishing House. He has received four National Book Awards while his poems and “textula” are read in political rallies, passed around as text messages, read on radio, posted on social media, printed in tabloid and newspaper columns, recited in school programs and utilized as material in oratorical and declamation contests. Rivera says he rediscovered something with his life-threatening illness. The fundraising concert “Tula, Awit, Dula ni Frank G. Rivera,” celebrating his 45 years in theater, will be held at the Emilio Aguinaldo College Theater along Taft Avenue on Oct. 18, 3 p.m. and 7 p.m. Featured performers are theater actors from Sining Kambayoka, Alab-Artistika, Philstagers, Earthsavers and A.C.T.I.O.N., as well as Liesl Batucan, Alegria, Njel de Mesa, Vince Tañada, Nenen Espina, Jim Pebanco, Fray Paolo, Dang Elio, Wally Tuyan and Joel Lamangan, plus other special guests. The show will be hosted by Cecile Guidote-Alvarez and Arthur Casanova, with video by CJ Andaluz and stage direction by Joey Nombres.